Many people wondered why Android's built-in browser is not called Chrome. 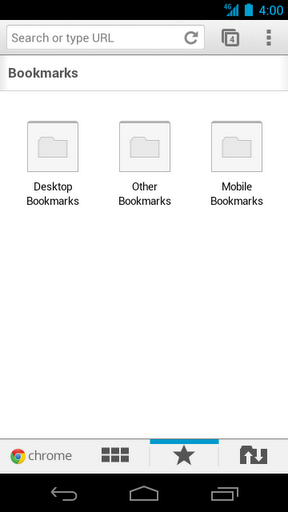 One of the reasons is that Android's browser doesn't have many of the features of the desktop browser: data sync (bookmark sync is available in Android 4.0), extensions, themes, apps. Another reason is that Android's browser is updated less frequently than the Chrome browser because it's included in the operating system. Most OEMs ship their own browsers, so not many people use the stock Android browsers. 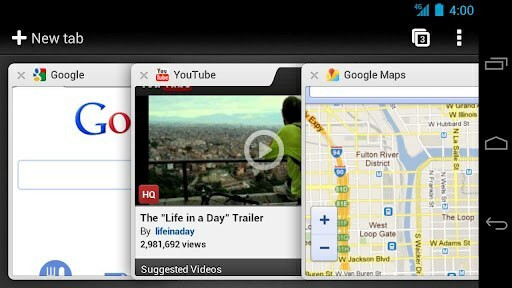 Now Chrome is available for Android 4.0 and it won't replace the standard browser on your device. "Like the desktop version, Chrome for Android Beta is focused on speed and simplicity, but it also features seamless sign-in and sync so you can take your personalized web browsing experience with you wherever you go, across devices," explains Google. Chrome for Android brings a new gesture for navigating to the next tab (flick instead of Ctrl+Tab), support for page prerendering (used by Google Search to fetch the top result), incognito mode, link preview and data sync for bookmarks, typed URLs and browser sessions. That means you can open a few tabs in the desktop Chrome, close your computer and continue reading the same pages on your Android phone or tablet. In addition to these features, Chrome for Android "brings support for many of the latest HTML5 features to the Android platform: hardware-accelerated canvas, overflow scroll support, strong HTML5 video support, and new capabilities such as Indexed DB, WebWorkers and Web Sockets". There's also support for remote debugging. "Chrome for Android is designed from the ground up for mobile devices. We reimagined tabs so they fit just as naturally on a small-screen phone as they do on a larger screen tablet. You can flip or swipe between an unlimited number of tabs using intuitive gestures, as if you're holding a deck of cards in the palm of your hands, each one a new window to the web," mentions Google. At the moment, Chrome for Android doesn't sandbox tabs and there's no support for Safe Browsing, but these features could be added in the feature. You can only try Chrome for Android if your phone runs Android 4.0 (you're using Galaxy Nexus, Nexus S, Transformer Prime or a different device with a custom ROM). Another limitation is that Chrome for Android is only available if you're in the US, Canada, UK, France, Germany, Spain, Australia, Japan, Korea, Mexico, Argentina, Brazil, but I'm sure you can use Market Enabler or the .apk linked here to bypass this restriction. I didn't think chrome for windows synced tabs, at least it didn't the last time i needed it to do so. It does, but you need to enable the feature in chrome://flags/ . It's called "Enable syncing open tabs". Finally. After a really long wait. We can't download it in ISRAEL!!! Please open it for all country. Thank you for the APK link! I have been waiting this for my Transformer Prime <3. I'm very impressed.. link preview is feature of the year.. swiping between tabs while viewing a page is awesome.. I hope there is a more intuitive way of closing tabs or opening a new one while viewing a web page .. but great first release.. love spell checker on web text input like what I'm typing into now! It's nice, but the flash player doesn't work (you can get it to work on the stock ICS browser), and there doesn't seem to be a 'request desktop version' option. Still in beta so hopefully these will be fixed in the future. Thank you so much for the .apk. As an expat in China it's a pain not being able to try so many location-locked betas. The chrome mobile version is the nice apps which can help to the mobile user that now they are getting to access the Internet more easily. Also the features are binded in it are good for any mobile user. It seems you have a typo: "added in the feature" instead of "added in the future"